A collection of over 200 monsters from the computer game translated into D&D terms, all ready for your players to fight or befriend. Publisher's blurb: "Here Be Dragons and Demons and Zombies! From the merciless Burning Legion to the five draconic broods, from the undead Scourge to the savage centaur, the world of Azeroth is rife with malevolent creatures. 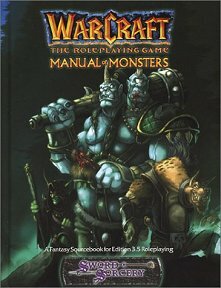 Manual of Monsters takes the many monsters and allies from the hugely popular series of Warcraft real-time strategy computer games and translates them for Dungeons & Dragons Warcraft the Roleplaying Game."